Eli on Greenbuilding list had a question on whether a proposed PV array that would be shadowed by some nearby power and telephone lines would suffer much of a power loss from the shadows. The little test below is an attempt to provide a little data toward answering the question. For those who just want the bottom line, it appears to me that regular power lines located a ways away from the PV panels (say 20+ ft?) probably won't have any serious effect on panel output. I'm not 100% sure of this, and you have tor read through the stuff below to see the why. I have a 10 module PV array, and it uses the Enphase micro-inverters. Each panel is managed separately by its own inverter and its possible to look at the output from each inverter separately. So, I put shading devices on some of the panels, and used the unshaded panel outputs as controls. In the discussion below, the modules are numbered left to right, 1 through 10. Panel 1 was shaded by a 1.66 OD piece of plastic conduit tubing. The shadow went horizontally across the module as a wire shadow would. Panel 3 was shaded by a 1.33 OD piece of plastic conduit tubing. The shadow went diagonally across the full module. Pane 10 was shaded by a 2 by 4 with the shadow going horizontally across the panel. I added the 2 by 4 shaded panel just to make sure there was one seriously shaded panel to compare the simulated wire shaded panels to. So, for these fairly large diameter "wires" located only about one foot away from the panels, the shading effect on power output is significant. But, see below for what might be more realistic conditions. For the 2nd shading test, I reduced the diameter of the tubes used for shading down to 0.63 inch OD tubes. Setup for 2nd test: Panel 1 shaded by horz half inch copper pipe, Pane 3 shaded diagonally by half inch EMT pipe, Panel 5 shaded by 1.7 inch dia plastic conduit pipe, and Panel 10 shaded by 2 by 4 with a little slopping onto panel 9. So, the smaller diameter horizontal pipe has no measureable effect, and even the full diagonal shadow from the smaller diameter pipe only cuts power by 2%. 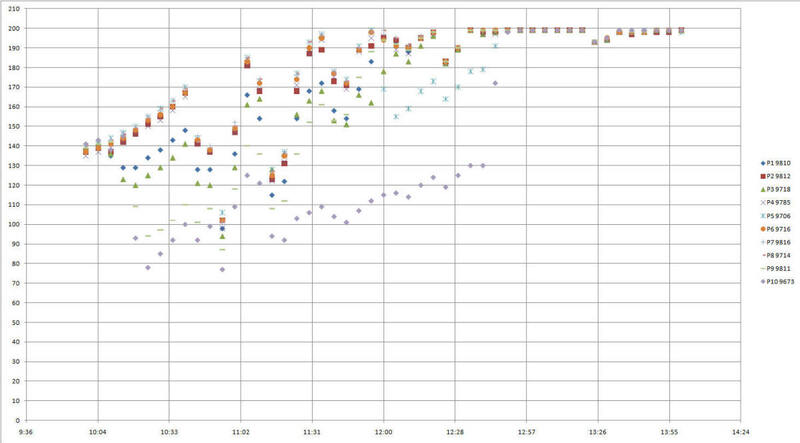 This shows the power output from all 10 modules at 5 minute intervals. The time spans both tests with a little time before the first test and after the 2nd test also included. 10:00 to 10:10am - Before the first test with all panels operating without shading. 10:10 to 10:40 First test shading conditions with good sun. 10:40 to 12:00 ish Some intermittent clouds. For the 2nd test, the sun sky was not perfectly clear all the time, but it was mostly good clear conditions. Toward the end of the 2nd test time period, the module output was starting to be limited by the inverters, which limit power out to 200 watts to protect the inverter. It appears to me that the panels were being limited to 200 watts, but there actual maximum output would have been very little more than 200 watts anyway. Its interesting to note that panel 9, which was getting just a little shadow from the end of the 2 by 4 has a noticeable drop in power. I think that the test as I did it is more severe than real wire shading situations, because it appears that as you get further from the shading wire, the shadow washes out and fills in a bit. Just below is a photo of the shadow of a nearby power line on the ground. While you can see the shadow, it seems pretty clear that its not the hard edged, deep shadow that I was getting for the test. This is perhaps due to diffraction of the sun light at the edges of the wire, or maybe the disk of the sun and the bright sky area around it has enough angular width to fill in the wire shadow given some space between the wire and the PV module? I would guess that the wires were of the order to 20 ft of the ground. The pictures are not perfect in showing the shadow, and my recollection is the shadow seemed a bit more distinct than the way it looks in the pictures, but it is definitely not the hard deep shadow that I got using the pipes that were only about 12 inches from the PV modules. I suppose that there are enough variables that one wants to be careful drawing hard and fast conclusions. The effect may vary with the construction of the PV modules, with the inverters, and with the wire distance and diameter. But, if it were me, and the power line 20 or so feet away, and it was only the wires doing the shading, and the wires were "normal" size, I'd probably go ahead and put the PV array in.